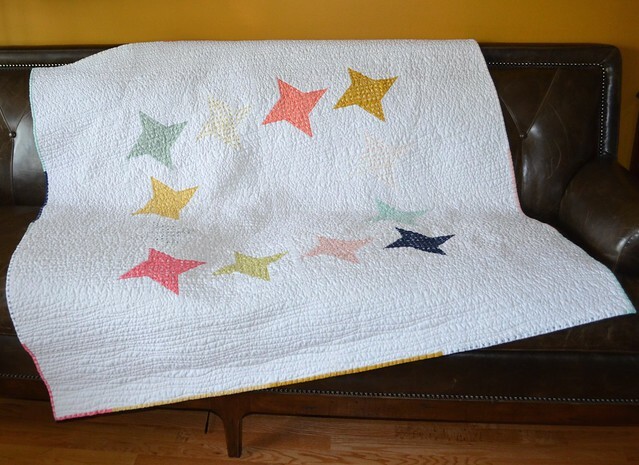 she can quilt: Halcyon - Ta Da! Halcyon is the pattern name for a quilt I have made twice already and each one was given away to someone special. She is a pattern in Issue 18 of Fat Quarterly, which has just been released - go here to get a copy. This issue focused on zakka. Halcyon follows the zakka tradition of being a utility blanket with touches of something very special. 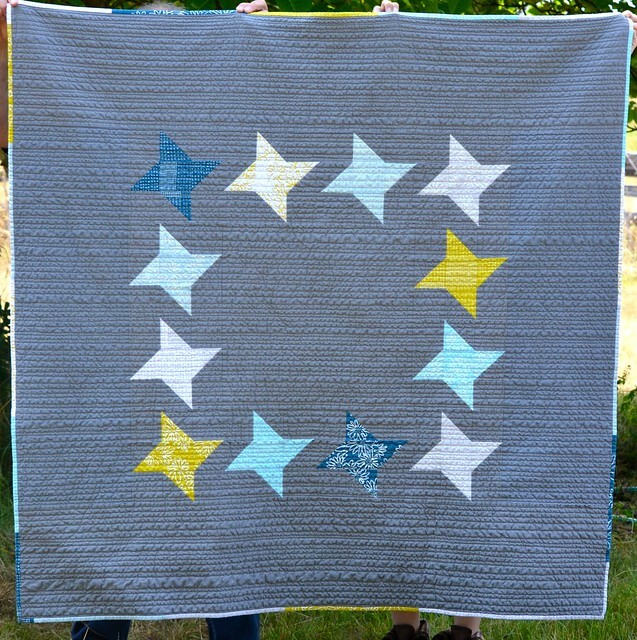 This quilt is 60" square and for both versions feature friendship stars made from the hand drawn and silk screened fabrics of my online friend Karen from Blueberry Park - these are beautiful fabrics and working with them is the same as working with any other quilting cotton. 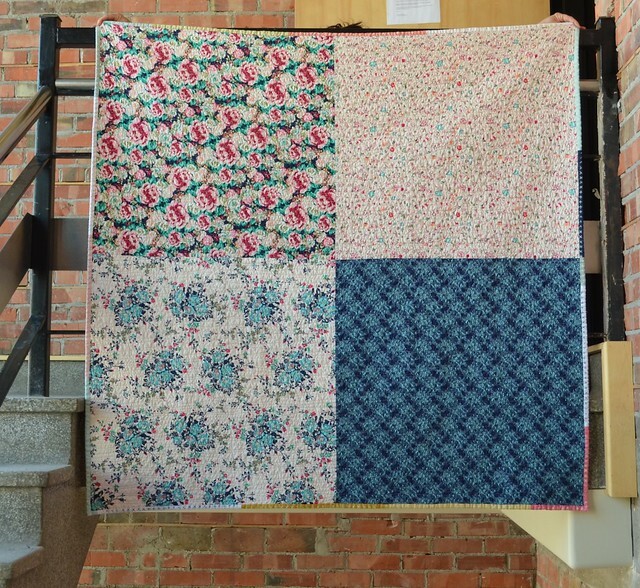 Each quilt used prints from an instalment of the Blueberry Park Fabric Club which I belong to. 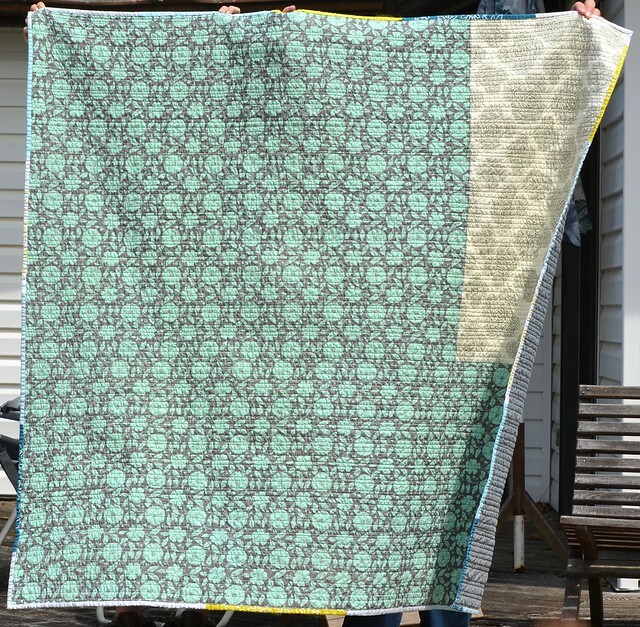 The backgrounds of each quilt are made from Essex linen linen/cotton blend. The bindings are scrappy, made from more of the Blueberry Park fabrics. 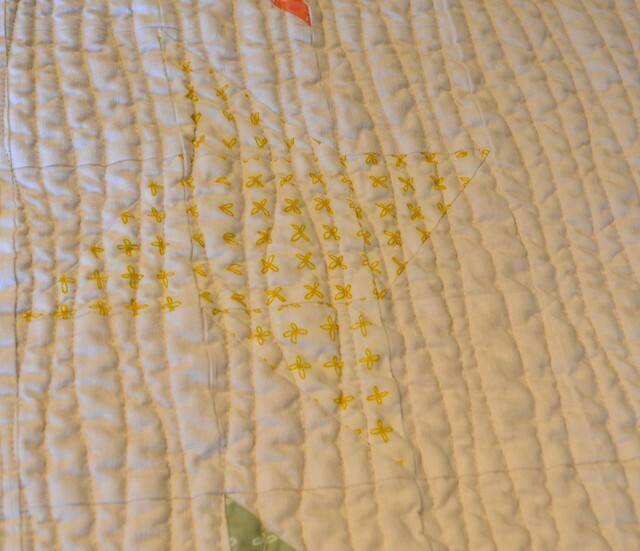 This is an easy quilt to make for a beginner and a satisfying finish for a quilter at any level. I quilted both quilts with a hand guided randomly spaced wavy line with my Millennium Long Arm quilting machine using cotton thread. This quilting is fast and easy and quickly becoming one of my favourite motifs for all over quilting. All these photos are after washing. 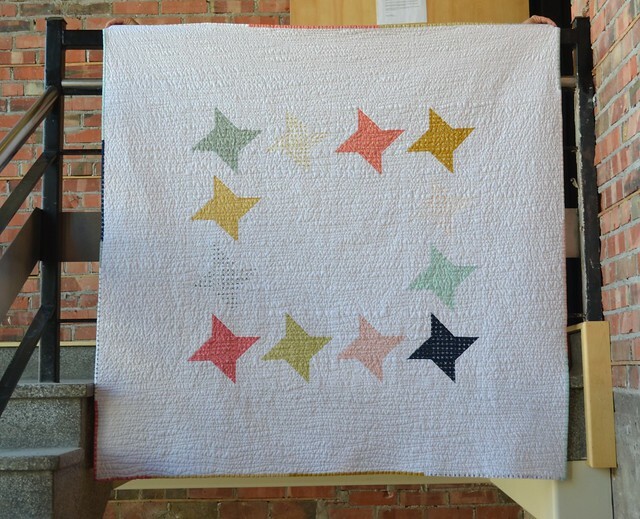 I debated including the very light fabrics for this quilt and decided that they were too pretty to leave out. 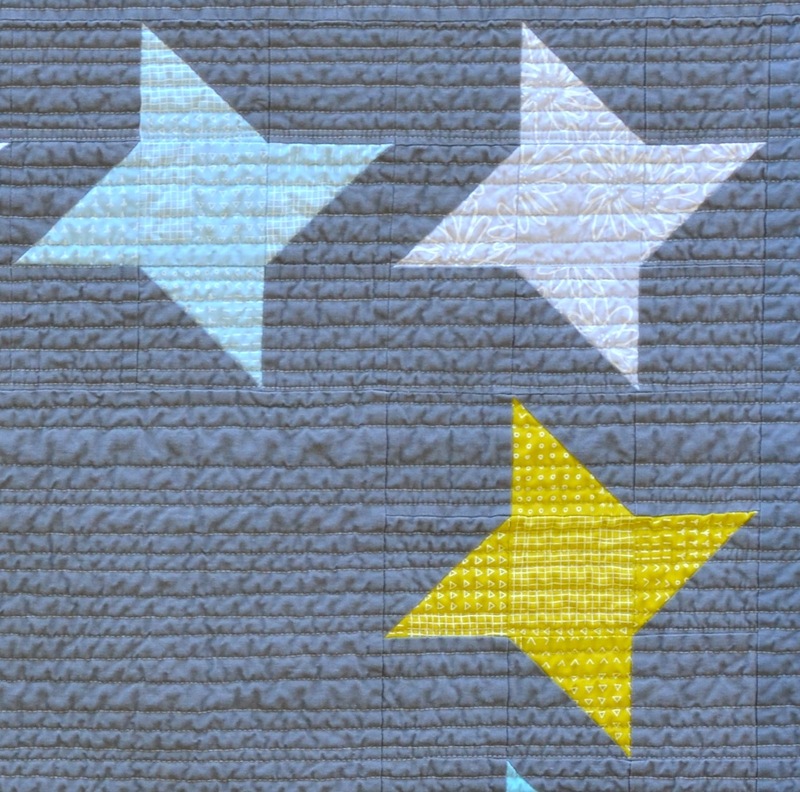 Also, the lightest stars draw you into the quilt, and encourage you to take a closer look at it. That seemed appropriate for a zakka theme. 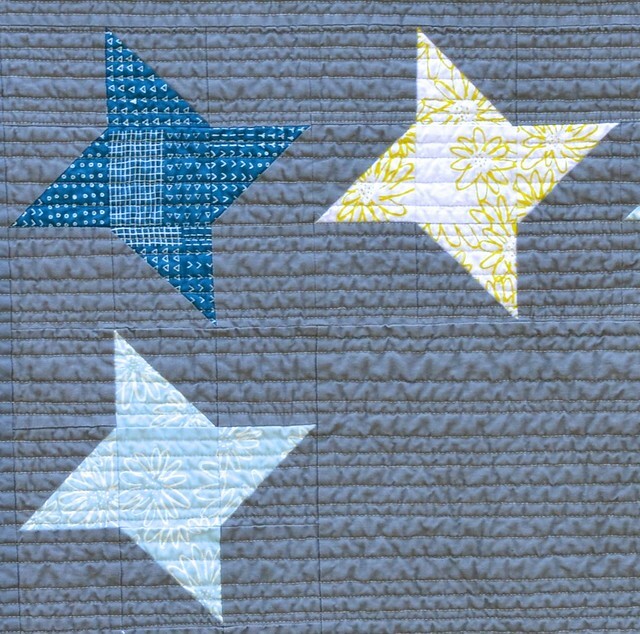 The quilting lines are 1" to 1/8" apart, with most of them around 1/2" apart. It makes a nice industrial modern texture while still being very soft and cozy. I used 100% cotton batting. 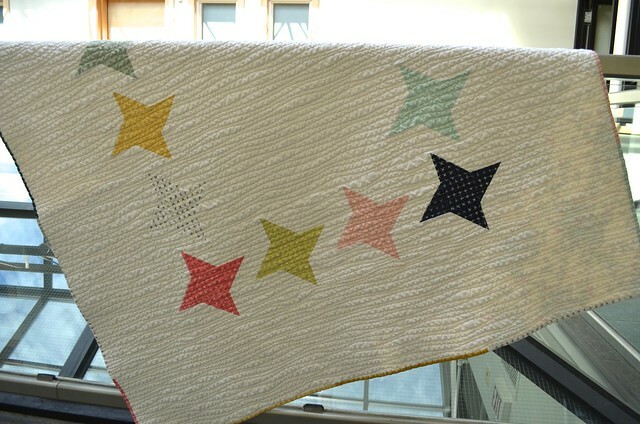 I found it challenging to photograph this quilt and bring out the right colours for the stars, given all its whiteness. In the photo above you can see the backing fabric as the sun backlit it a bit. There is her back, I am becoming very fond of these four patch backs. These four fabrics are from the Floressence line by Art Gallery Fabrics. I made this version of Halcyon just before I left on vacation. In fact I made her in the last couple of days before I left and finished the binding after I left. If you look closely you will see that I had two different dye lots of this linen, but it just makes the quilt more interesting. Another installment of the Blueberry Park Fabric Club had arrived, and I was having a special visitor for the summer who, I decided, would need a quilt to take home. So I pulled out some Essex Linen in grey and got to work. Look at those prints, I really love them. I might have to make another version for me. Here is her back. I used this favourite and hoarded print and a bit of Amy Butler's fabric too. It is very hard to make a quilt, and then make another and not share either of them here. I did sneak a few in progress shots onto Instagram. I am so glad that Fat Quarterly is now out and I can show them off. And there is my dog, there for scale - well we can say that now at least. He actually is hard to get to stay still for a photograph so this was a nice surprise. 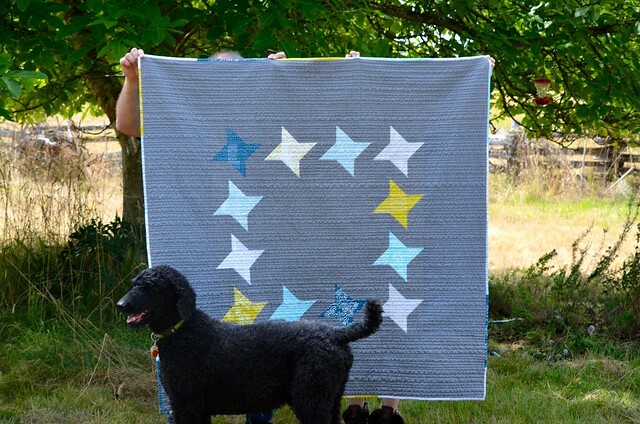 There are a lot of other beautiful projects in Issue 18 of Fat Quarterly, Halcyon is in good company and I was thrilled to have my quilt included. Very nice! And the texture!! That just makes them both! 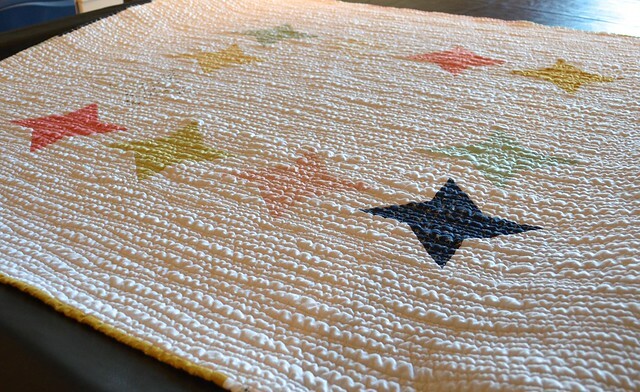 Great pattern & I love the textured quilting! 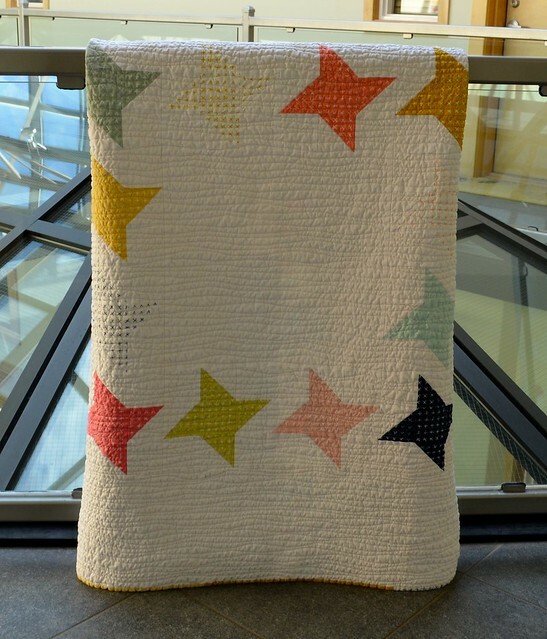 There is nothing utilitarian about these quilts Leanne! They are simply beautiful! Oooh, lovely way to use those Blueberry Park fabrics! What a sweet pattern. 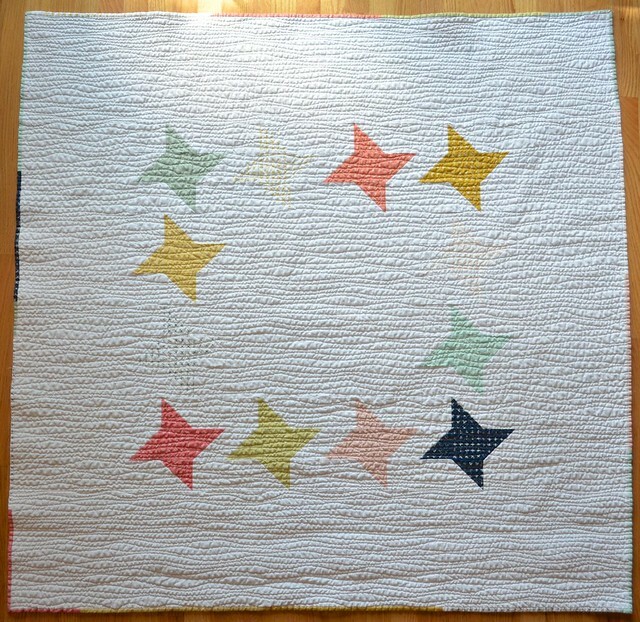 I've always been a sucker for friendship stars! I just got my very first pieces of Karen's beautiful fabrics and I'm smitten. Love the simplicity of this design as it has such impact. Lovely to see yu in FatQuarterly. Leanne, these are stunning. I have to say that the Fat Quarterly version is my favorite. I absolutely love that you included those low volume prints with the light background. And the quilting -- perfection!! I love the simpleness (is that a word?) of these and you're right, the lighter prints in the first one really made me look closer! As usual love the textured quilting, but there's nothing new there! I just love these! Great job! 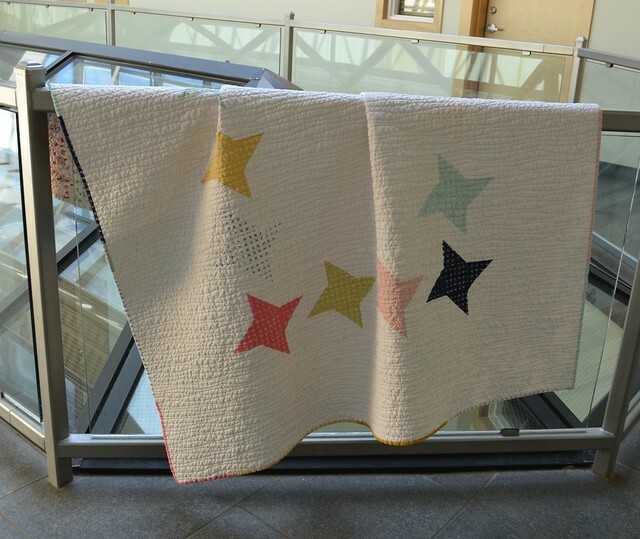 Beautiful quilts, Leanne! Your production output has been greatly amped up since you got your long arm, and it's fun to see all your quilts in all their glory. Love where you photographed your light-background quilt, as the angles and glass really complement the fabrics and quilting.